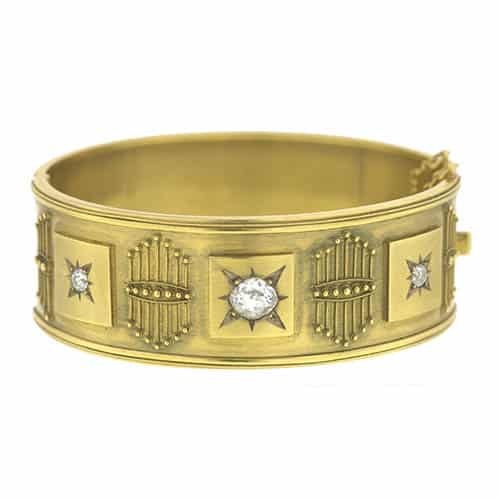 Etruscan Revival Granulated Diamond Bangle, Castellani. Caetani was a Dante scholar, a historian, a talented woodworker and an artist familiar with jewellery manufacturing techniques. He was also a darling of Roman high society. 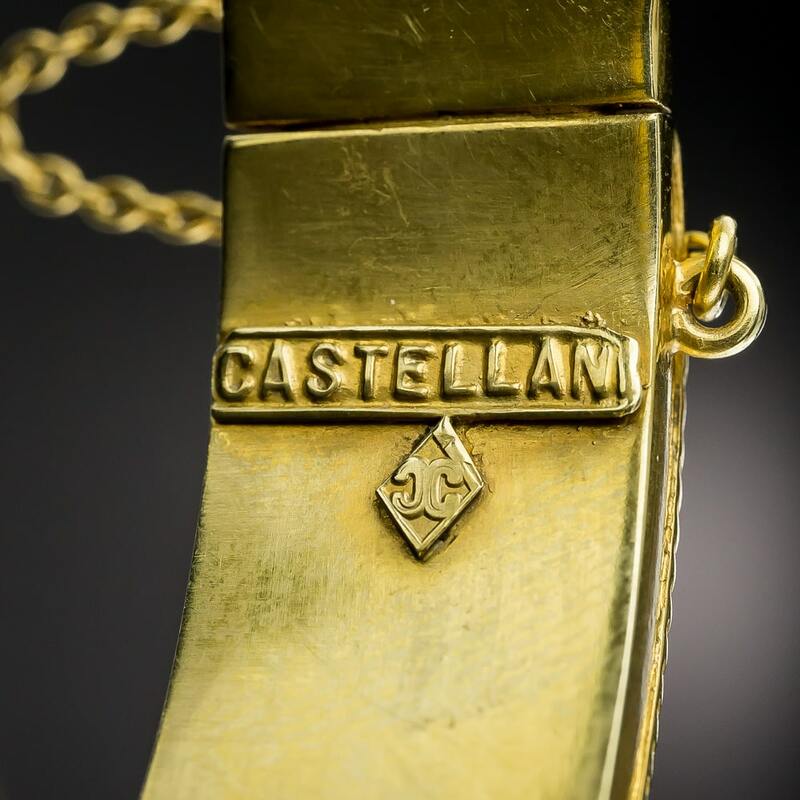 Though Caetani was never formally employed by the firm, his creativity and connections helped the Castellanis to prosper. 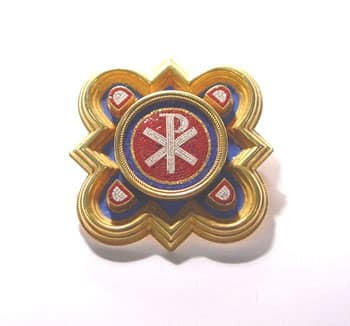 Micromosaic and Gold Brooch by Castellani, c.1880. Image Courtesy of Wartski. By the early 1830’s, Fortunato Pio had begun making archaeological style jewellery. In 1836, when the Etruscan Regolini-Galassi tombs were opened, papal authorities invited him to study the jewellery found there. In the 1840’s and 50’s, he and his sons, Alessandro and Augusto, were also given access to the huge collection of antiquities acquired by the director of the papal savings bank, Marchese Fiolanni Pietro Campana. While now dispersed, the Campana collection was then complete and at the Castellanis’ fingertips. They realized that the ancients created their designs by adding detail to the metal rather than carving, punching, cutting and otherwise deforming the metal to create an effect. They were able to recreate the look and feel of these Ancient pieces using granulation, wirework and other old-style gold working techniques. Such techniques had been seemingly lost for centuries until the brothers discovered a remote area of the Apennines where they were still being practiced. 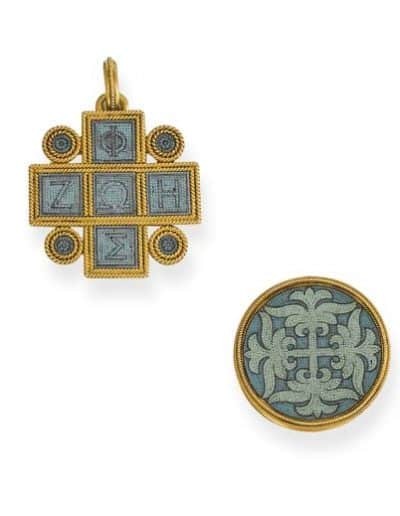 Castellani Cruciform Pendant c. 1865 and Stylized Lily Brooch c. 1860. Photo Courtesy of Christie’s. The firm’s designs continued to be wildly popular. At the 1867 international exhibition in Paris, “nearly all” of the jewellers featured Archaeological-style jewels in their showcases.4 The firm’s success peaked in the 1870’s. In the 1880’s, the Rome location was handed over to Augusto’s son, Alfredo. Until his death in 1914, Augusto busied himself with, among other things, attempting to “document the progression of Italian goldsmiths art from pre-historical times to the present.”5 He suggested eight time periods: primitive, Tyrrhenian, Etruscan, Sicilian, Roman, medieval, Renaissance, and modern. Though his categories are not accepted as exhaustive today, it was one of the first modern attempts to divide the history of jewellery design into eras. 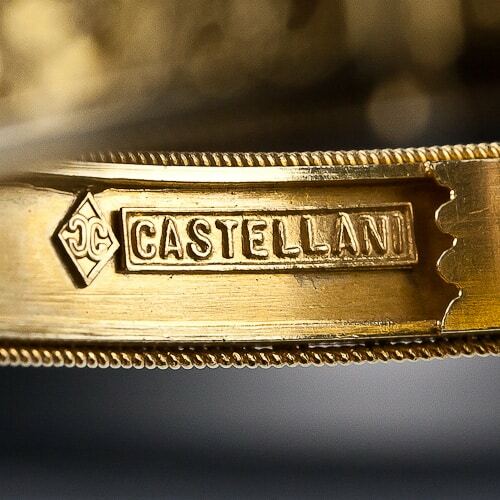 In 1930, Castellani closed its doors when Alfredo, the last in the line of Castellani jewellers, died. Goldsmiths & Jewelers working in the archaeological style. Specialized in goldwork, not precious stones. Began production of gold jewelry based on early Roman excavations with filigree. Advisor at the excavation of the Regulini Galassi tomb with an historic cache of Etruscan metal work. His passion turned to deciphering the secrets of these ancient goldsmiths. Fortunato Pio Castellani (1793-1865) retires. Featured their Etruscan style jewelry with granulation. Became a tourist destination for Archeological Revival jewelry. Opening of Paris and London workshops. Closed after the death of Alfredo. Soros, Susan Weber & Stefanie Walker, ed. 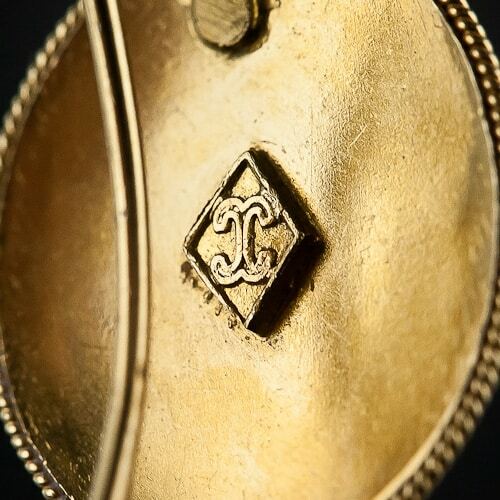 Castellani and Italian Archaeological Jewelry. New Haven: Yale University Press, 2004. Munn, Geoffrey C. Castellani and Giuliano: Revivalist Jewellers of the 19th Century. New York: Rizzoli, 1983. Rudoe, Judy. 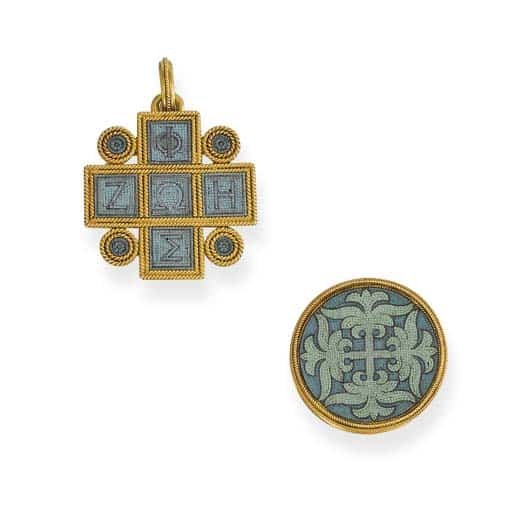 “Micromosaics and Their Sources,” in Castellani and Italian Archaeological Jewelry. New Haven: Yale University Press, 2004.